Minister for Transport, Infrastructure and Climate Change Stewart Stevenson today announced the appointment of a new member to the Public Transport Users' Committee for Scotland. Hugh Flinn was brought up in Edinburgh where he was educated at Daniel Stewart's College. After obtaining a first-class degree in philosophy at Bristol University he worked in local government in London. He worked as a housing officer in Camden and then in various strategic policy posts in Hackney, where he was responsible for drawing up the Council's first Performance Plan. In 1999 he returned to Scotland when he was appointed Clerk Team Leader in the Scottish Parliament, where he led the Chamber Desk, which dealt with all parliamentary questions and motions, until his retirement in March 2008. Not being a car owner, Hugh has been a dedicated public transport user all his life, travelling the length and breadth of Scotland on buses, trains and ferries. He lives in Leith. Mr Flinn does not hold any other Ministerial Appointments. This appointment will be for 3 years and will run from 01 August 2008 to 31 July 2011. This post is part-time and attracts a remuneration of £100 for a time commitment of 2 days per month. All appointments are made on merit and political activity plays no part in the selection process. However, in accordance with the original Nolan recommendations, there is a requirement for appointees' political activity (if there is any to be declared) to be made public. Mr Flinn undertook no political activity in the past five years. Young drivers across Scotland are to be targeted using the latest technology in a new drive to improve road safety. For the first time, road safety messages are to be sent directly to the mobile phones of thousands of young people in cinemas throughout Scotland using the latest 'Bluetooth' technology, Transport Minister Stewart Stevenson announced today. The technology works by beaming a film clip onto the young person's phone as they arrive in cinema foyers. Latest research shows that young people are now much less likely to engage with traditional media channels such as television and are now almost 60% more likely to instead respond to mediums such as the mobile phone and the internet. The mobile film clip is being released in conjunction with a new cinema advert by Road Safety Scotland highlighting the danger of momentary distractions as a contributory factor in road accidents. "The latest statistics show a decrease in road accidents in Scotland in 2007, but we cannot and will not be complacent. "Too many people are still dying on Scotland's roads and sadly, young drivers continue to be over-represented in these deaths. "As a Government, we are constantly looking at new ways to reach this age group and I am determined that we look beyond the traditional and towards the innovative in our efforts to save lives. "This campaign is new, it is innovative and it can make a real difference. "97% of young people between the ages of 18-24 now own a mobile phone. That is a huge audience we can potentially reach with this campaign and it has my full backing. The technology works by beaming an advert onto a young person's phone. Once accepted, the clip showing young people travelling in a car is interrupted as a text message is received. After checking the message, the clip resumes to show what happens when drivers are distracted. The message "one distraction is all it takes" then appears. The latest road accident figures for Scotland were published on 30th June 2008 in "Key 2007 Road Accident Statistics". They showed that 282 people died on Scotland's roads in 2007 (a 10% decrease from 2006), with 2,316 people seriously injured (12% fewer than 2006). Latest statistics from TGI media research (2008) shows that 97% of young people between the ages of 18-24 now own a mobile phone. They are 59% more likely to respond to mediums such as the mobile phone and the internet. 17-25 males are 174% more likely than the national average to use their Bluetooth technology. The Transport Minister has brought together an expert group on road safety from across Scotland. It is made up of some of the leading thinkers in road safety from across the country, including the police, road safety experts, a driver behaviour psychologist, and others. 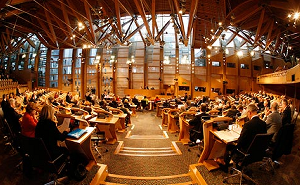 The group's remit is to give their views on how to improve road safety in Scotland. Their views will help inform a new 10-year road safety strategy for Scotland. The section of the A7 at Broomholm, south of Langholm, which has been closed since torrential rain washed away the embankment earlier this month, is expected to re-open at 6pm today. Essential repairs have been completed ahead of schedule, with Transport Scotland and its operating company, BEAR Scotland, working with a team of specialist contractors around the clock since July 10 to complete the works in time for Friday July 25, Langholm Common Riding. "Not only is the re-opening of the A7 at Auchenrivock excellent news for the local community, it is a real boost for the tourist industry and the economy of the South East of Scotland as a whole. "I am delighted that the 24/7 approach adopted immediately by Transport Scotland and its operating company BEAR Scotland after the road was damaged two weeks ago has delivered such speedy results. "The Scottish Government has been very aware of local concern about the closure of this vital route and I visited the scene last week to inspect progress. It was always our firm intention to partially open the road to traffic before the Common Riding this weekend if at all possible, but local people will be delighted that our engineers have managed to make the A7 fully available to road users in time for this important event." Before the repair and restoration work could begin in earnest, large amounts of debris and trees had to be removed from the slope below the carriageway. The next phase involved approximately 10,000 tonnes of rock fill being delivered to the site to stabilise the embankment. The final phase was the reconstruction of an estimated 85 metres of carriageway and the installation of a new drainage system and safety barrier. The repair to the slope supporting the A7 trunk road above the River Esk is substantial and the road will continue to be monitored for a period of time. It is possible that some minor works may be required in the future; however, the road will remain open following the Langholm Common Riding. "Together with Transport Scotland, we have made every effort, including working 24 hours-a-day, to have the road repaired and re-opened as soon as possible. "We have also ensured local residents and their elected representatives have been kept up to date with the progress of the work. "We are, of course, well aware of the impact the closure has had on the local community and we thank everyone for their patience and understanding during these essential roadworks. Naturally, we are pleased the road is open in time for such an important local event as the Common Riding." Banff & Buchan MSP Stewart Stevenson has decried the House of Lord’s refusal to acknowledge the need for Scotland’s Fishing industry to be supported during current high fuel prices. The House of Lord’s report rejects proposals for fishermen to be given support to keep them in business for the duration of the current high price of fuel, instead recommending that high fuel costs and the bankruptcy that will follow for many should be used to drive fishermen out of business in order to address Europe wide over-capacity. “I am outraged that the House of Lords has chosen to betray Banff & Buchan and the whole of Scotland’s fishing industry in this manner. This report yet again shows the absolute contempt in which Westminster holds Scottish interests. “The report itself acknowledges that Scotland has made huge cuts to its fishing fleet to meet the problem of over-capacity and has now reached a sustainable level. For the committee to recommend that Scotland’s fishing fleet should be driven towards massive cuts through high fuel prices because other European fishing fleets have failed to reduce their fleets is simply staggering. “The House of Lords is effectively recommending that our fishing industry should be punished for its responsible attitude. This could have devastating consequences for many families in Banff & Buchan as boats get driven out of business by Westminster’s negligence. “The SNP government has promised to make resources available to help Scotland’s fishermen for the next three years, but without support from the UK government, there will be a limit to how much can be done”. Banff & Buchan MSP Stewart Stevenson has expressed his delight at the announcement from Health Minister Shona Robison that Scotland’s carers will benefit from 10, 000 extra respite weeks. Carers play a vital role in looking after loved ones who require support in their daily lives, and this announcement by the Scottish Government will mean that they are able to receive time to look after their own health and wellbeing. The number of extra respite weeks across Scotland will increase by two thousand in 2008/09, by six thousand in 2009/10 and reach ten thousand additional weeks by 2010/11. “I am extremely pleased that more support will be given to the carers of Banff & Buchan as part of this announcement. “It is important for both carers and those they are looking after that carers are able to take short breaks, whether it is for a holiday, a hobby or even just to catch up on housework. Banff & Buchan MSP Stewart Stevenson has voiced his alarm over the spiralling cost of cleaning up the UK’s decommissioned nuclear power stations. The total bill has risen by £20 billion over the last three years to reach a total price tag of £83 billion, according to Nuclear Decommissioning Authority estimates. “These latest figures show that even when it comes to shutting them down, the price of nuclear power is staggering. That the costs of cleaning up nuclear sites have risen by £20 billion in just three years is simply incredible, and a clear sign that the process is out of control. “The cost of new reactors, let alone the process of closing down those at the end of their life-spans are enormous, especially when the money could so easily be better spent building cleaner, safer and more cost-effective renewable power stations. “The last thing the residents of Banff & Buchan need is to be shelling out to pay for more nuclear white elephants. That’s why I am thoroughly relieved that Scotland will not be building any more nuclear power stations thanks to the SNP government in Holyrood”. A multi-million pound scheme to upgrade part of the A68 took a significant step forward this week. National transport agency Transport Scotland has published the draft Road Orders, Environmental Statement and the draft Compulsory Purchase Order for the £5 million A68 Pathhead to Tynehead Junction. This project is part of a wider commitment to a three-scheme improvement package on the A68, worth in excess of £40m. This investment will also deliver the Dalkeith Bypass, due to open to traffic shortly, and the Soutra to Oxton scheme for which early preparations are already under way. The Pathhead to Tynehead project involves construction of almost two miles of new wide carriageway and improvements to the existing footway/cycleway. Once complete, not only will this provide guaranteed overtaking opportunities on both the north and southbound carriageways it will also deliver new right-turn facilities at all remaining junctions and increased visibility across Fala Tunnel. Alongside the Dalkeith Bypass and the Soutra to Oxton scheme, this will bring real benefits to communities and businesses across the south east of Scotland through improved traffic flow and journey times. "We welcome this latest milestone in the development of a three-scheme package of improvements for the A68, a key commuter route in south east Scotland. The combination of these schemes will provide a significant boost to the local economy while helping to ease congestion and improve safety in Midlothian. "Local communities adjacent to the A68 will see real benefits from these improved links particularly when the Dalkeith Bypass opens later this year." Banff & Buchan MSP Stewart Stevenson has welcomed the announcement that the much needed dualing of the A90 between Aberdeen and Ellon has moved a step closer with the news that Transport Scotland has now published draft Compulsory Purchase Orders for the land needed to upgrade the five mile stretch of road. The multi-million pound project will remove the bottleneck created by the stretch of single lane road and speed up journey times between Banff & Buchan and Aberdeen, particularly during congested rush hours. “This long awaited upgrade will speed up journey times for Businesses and commuters between Banff & Buchan and Aberdeen, bringing real economic benefits to the area and making it even easier to travel to and from Aberdeen. “Residents of Banff & Buchan who commute to and from Aberdeen will be able to spend less time on the road and more time with their families once the upgrade is complete. Local businesses, that sell their products in Aberdeen or beyond, will be able to move their goods more efficiently. “Given the benefits this will have for Banff & Buchan, I’m sure that fellow residents of the area will join me in hoping for as speedy an approval process as possible so that work begins on schedule”. Banff & Buchan MSP Stewart Stevenson has welcomed the news that the Westminster Treasury has shelved plans to hit struggling motorists’ pockets even harder with a 2p Fuel Duty increase. Motorists are already struggling to cope with high fuel prices, something that the UK government’s ill advised plans would only have made far worse. In rural areas like Banff & Buchan, where there is often little alternative but to use a car, the effects of the increased tax would have been the most devastating. “I’m sure that fellow residents of Banff & Buchan will be as relieved as I am that Alistair Darling has finally seen sense and scrapped his planned tax hike in response to SNP demands. “However, this must only be the first step in addressing the spiralling cost of fuel. The Treasury must follow up this move with the introduction of a Fuel Duty Regulator so that the level of fuel taxation falls as the price of oil increases. This would stabilise the cost of filling up a car and ensure that high oil prices don’t cause the kind of financial hardship we are currently seeing. “The Treasury has already taken in £6 billion more than it expected in North Sea oil revenues as a result of high oil prices and to not offset the higher prices at the pump with these gains is to unfairly punish motorists. “I am glad that SNP pressure in Glasgow East has caused this shift in policy, but there is still more that must be done. The SNP will continue to press for a fairer deal for motorists and I hope that Alistair Darling will continue to follow our recommendations”. Banff & Buchan MSP Stewart Stevenson has expressed his anger at the news that Scotland is to lose another MEP as a result of Westminster’s Delegated Legislation Committee’s decision. Scotland has already suffered the loss of an MEP in 1999 when the number of Scottish representatives fell from eight to seven, meaning that with this new cut Scotland has lost 25% of its European representatives within a decade. “This decision will make it even harder for Scotland’s MEPs to stand up for Banff & Buchan’s fishing industry in European negotiations. “Westminster has ignored the unique geographical problems and constitutional complexity of Scotland with this decision. Scotland is the largest European region so our MEPs have to travel far more than others as it is. With just six of them remaining, the task of representing Scotland in Europe will be made even more difficult. “We now have the ludicrous situation where Luxembourg, with a population smaller than Edinburgh, enjoys the same level of representation as Scotland. Ireland, with a population significantly smaller than Scotland, will have twelve MEPs and Finland, with an almost identical population to Scotland, will have thirteen, more than double that of Scotland. “What is clear is that Scotland needs independence if we are to have a strong voice in Europe. Along with double the number of MEPs, Scotland would gain a seat at the Council of Ministers and a European Commissioner, where currently we go unrepresented. Banff & Buchan MSP Stewart Stevenson has welcomed the announcement that the Scottish Government has met with fishing industry representatives and pledged to work with the sector to produce a three year plan to achieve a sustainable and profitable industry that has adapted to high fuel costs. The package brokered by the Scottish Government Fisheries Minister Richard Lochhead will help the Scottish fleet adjust to high fuel prices in the months and years ahead, with an aim to deliver the first measures as soon as possible. Although the Scottish Government will make resources available to support the programme the total scope and nature of the plan is dependent on securing additional aid from the UK Government and the European Union. "The SNP Government is determined to support our fishing communities in the face of rising fuel costs that continue to undermine the industry's recent optimism. "Although the legislative restraints imposed on the Scottish Parliament mean we are essentially fighting with one hand tied behind our backs, we will continue to work with the industry and push to deliver a range of measures that can ensure we retain a sustainable and profitable fishing industry in Banff & Buchan. that Scotland receives a share of the extra revenue enjoyed by the UK Treasury as a result of high fuel prices. "Since coming to power we have be fighting to help key sectors such as fishing and we will continue to do so. In the meantime, we are seeking to bring forward resources from Scotland's existing share of the European Fisheries Fund and will seek to identify other resources that can be made available. "I am pleased to say that in Richard Lochhead we have a Scottish Fisheries Minister who is committed to representing the interests of Scotland’s fishing industry, a commitment that was, incredible as it seems not made by the London lackeys in the previous administration". Banff & Buchan MSP Stewart Stevenson has criticised the bizarre claim of Scotland Office Minister David Cairns, made during Scottish Questions at Westminster, that an extra £6 billion pounds of taxation pouring into the UK treasury from Scotland’s oil industry does not represent a windfall. “In anybody’s book, an unexpected £6 billion of money raised can only be called a windfall. For David Cairns to attempt to claim otherwise is simply beyond comprehension. “What is clear is that Scotland’s black gold is pouring into the black hole at the heart of the treasury, never to be seen again. With the news that perhaps as much as 25 billion barrels of oil remain in the North Sea, there is still time for us to follow Norway’s example and establish an oil fund that will see us benefit from this natural resource in perpetuity.